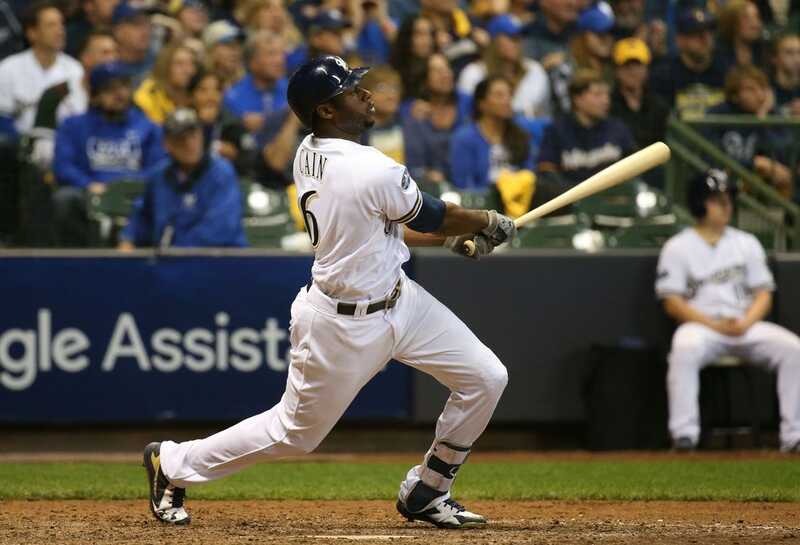 MILWAUKEE -- The Milwaukee Brewers scored four runs in the first inning on Friday and didn't look back, defeating the Los Angeles Dodgers 7-2 in Game 6 of the National League Championship Series to force a decisive seventh game at Miller Park on Saturday night. Facing a must-win situation to keep their season alive, the Brewers responded with an early offensive flurry to back left-hander Wade Miley and three relievers. Jesus Aguilar had three hits and three RBIs while Lorenzo Cain and Ryan Braun collected two hits apiece as the Brewers out-hit the Dodgers, 11-5. Miley spaced two runs, five hits, two walks and four strikeouts in 4 1/3 innings after rebounding from an early Dodgers strike. Traditionally a threat in the middle of the batting order, Dodgers first baseman David Freese led off Friday and homered to right field on the fifth pitch of the game. Incidentally, Miley threw only five pitches when he walked Cody Bellinger to open Wednesday's Game 5 in Los Angeles before immediately yielding to righty Brandon Woodruff. While Game 5 marked an intended cameo for Miley -- Brewers manager Craig Counsell still was addressing his gesture of gamesmanship Friday -- Miley's Game 6 outing was designed for a much longer haul. His first inning featured 25 pitches while his entire night had 87. Milwaukee's two-out eruption in the bottom of the first against Dodgers left-hander Hyun-Jin Ryu offered an invaluable boost. Aguilar opened the rally with a two-run, opposite-field double to right field, snapping out of a slump that had plagued the first baseman for much of the postseason. A Mike Moustakas double to right scored Aguilar on the next pitch, and catcher Erik Kratz's RBI single chased Moustakas home one batter later. Even Miley tagged a ball, flying out to deep center to end the inning. Entering Friday, Ryu (0-1) had not allowed four earned runs in any of his 17 previous starts in 2018, including postseason. With the Dodgers one victory away from advancing to successive World Series for the first time since 1977-78, he allowed four earned runs the first inning and five on seven hits in three innings overall. Los Angeles finished 0-for-3 with runners in scoring position and left six men on base. Milwaukee right-hander Corey Knebel escaped trouble against the heart of the Dodgers' order in the fifth to set the tone for the bullpen, a Brewers' strength throughout the playoffs. An electric, sellout crowd of 43,619 roared in approval. Most in attendance booed Machado, the Dodgers shortstop, whenever he batted or handled a defensive chance, reacting to a Game 4 incident in which Machado made contact with Aguilar while running through first base on a groundout. Knebel (1-0) earned the victory with 1 2/3 innings of scoreless relief, striking out two and hitting a batter. Jeremy Jeffress and Corbin Burnes combined to blank the Dodgers for the final three innings. Freese drove in both Los Angeles runs and was the only Dodger with a multi-hit game. The Los Angeles bullpen did its part, as well, with Julio Urias, Alex Wood, Dylan Floro and Caleb Ferguson combining on three innings of scoreless relief before Milwaukee scored two late runs charged to Kenta Maeda. The Brewers' early burst simply proved to be too much. And enough to extend Milwaukee's season for at least another day.